We offer Flash dryers in three type negative draft (negative pressure drying), positive draft (positive pressure conveying) and balance draft (positive-negative conveying). Flash type or pneumatic dryer are used for removing surface or unbounded moisture from a feed. Technology behind it is relatively low residence time and moisture is flashed off, a consequential amount of evaporative cooling takes place allowing higher inlet temperature to be used without excessively heating the product. 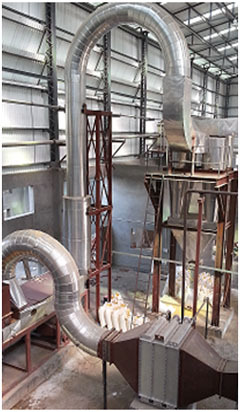 We offer a complete flash dryer package including hot air generation system via steam or gas, feeding system, cyclones or air bags, wet or dry scrubber for capturing fines, product collection section, control & instrumentation. We also provide optional accessories like feed preconditioning depending upon application, product conveying cooling. Starches from Potato, Corn, Wheat, Cassava, etc.